Brain functions are complex. People who study them have medical degrees and an impressive set of letters after their name. But despite all of that, no one seems quite sure what each part of the brain does. This naturally generates a lot discussion and conference trips to exotic locations. What makes humans so special is not only that our brains are large relative to our size but our neocortex, responsible for social interaction, accounts for 80% of it. In shrews it is about the same size as another part of the brain, the medulla, that controls vital body functions such as the heart rate and breathing. In monkeys and apes the neocortex is 20-50 times larger and humans it is a massive 105 times larger. It is difficult to overstate how much social acceptance drives our behaviour whether consciously or subconsciously. 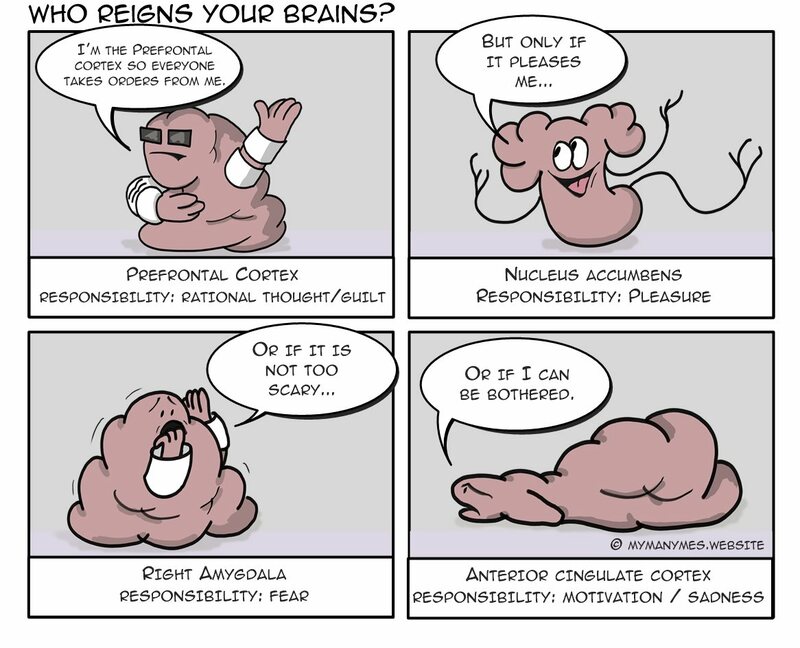 Out of the 150 or so named regions of the human brain, four lucky parts were selected to appear in this comic. I would like to welcome three from the limbic district of the brain; amygdala, nucleus accumbens, anterior cingulate cortex and the fourth, the prefrontal cortex, from the neocortex. The four areas are interconnected and are responsible for a range of functions. Some artistic simplification has been employed by the comic as the human brain is too complex for a particular emotion or behaviour to be directly attributed to a single area. The amygdala is actually an almond shaped structure and is an important part of the circuit that allows the brain to detect and respond to threats*. The nucleus accumbens plays a central role in the reward circuit such pleasure. In the 1950s, James Olds and Peter Milner implanted electrodes into this area of the brain of a rat and found that the rat chose to press a lever which stimulated it. It continued to prefer this even over stopping to eat or drink. Unsurprisingly, the nucleus accumbens has also been linked to addiction. The anterior cingulate cortex is associated with a number of functions such as reward based learning, detection of errors, anticipation of tasks and the regulation of emotions including sadness. A study has also revealed that meditation-related anxiety relief is associated with activation of the anterior cingulate cortex. The prefrontal cortex sits in the driver's seat at the very front of the brain. It is responsible for rational thought such complex planning and prioritising competing information as well regulating behaviour such as social control. Your prefrontal cortex also houses your active working memory.